Norway at the Olympics is a history which began in 1900. 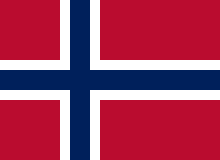 The International Olympic Committee's official abbreviation for Norway is NOR. A team from Norway took part in the Olympic Games for the first time in 1900. It has sent athletes to almost every Games since then. It did not take part in the 1904 Games. It was part of the American boycott of the 1980 Summer Olympics in Moscow. Norwegian athletes have won a total of 144 medals at the Summer Olympic Games. It has won its highest amount of medals in the Summer Games in sailing and shooting sports. At the Winter Olympic Games, Norway has won 303 medals. 107 of these medals were gold. This is more than any other nation. cross-country skiing and speed skating are its the top sports. Norway is one of only three nations (along with Austria and Liechtenstein) to have won more medals at the Winter Games than at the Summer Games. The National Olympic Committee for Norway was created 1900. *Total medal counts include three medals – two silver and one bronze – awarded in the figure skating events at the 1920 Summer Olympics. These medals are included in the summer games medal totals and the winter sport medal totals. This is why the totals for summer and winter games do not match the totals for summer and winter sports.